Benedict XVI remarked on the fact that poverty forces many people to emigrate "in search of better living conditions, often bringing negative consequences to the stability of marriage and the family." He also recognized the prelates' efforts "to promote reconciliation and peace in the country and so overcome the painful events of the past." The executive council of the ruling conservative ARENA party in El Salvador has narrowed the list of its possible candidates for the 2009 presidential elections to three names. All three, until recently, were members of president Tony Saca's administration. The three finalists are Ana Vilma de Escobar, the current Vice President, Luis Mario Rodríguez, former Legal Affairs Secretary to the president, and Rodrigo Ávila, former head of the National Police. The final selection of a nominee to run under the ARENA banner will be made on March 15 by a show of raised hands at a meeting of ARENA party officials. As food prices have surged, the most vulnerable have seen dinner-table portions grow smaller, calorie intake decline and basic nutrients reduced. “At this stage it is still premature to provide figures, but we fear a deepening nutritional crisis among the poorest segments of the population, those already food and nutritionally insecure,” says WFP El Salvador Country Director Carlo Scaramella who is coordinating a regional study of the impact of recent rising prices in the Central America. “At the same time, what we are seeing is the emergence of a new group of nutritionally and food-insecure people among the poorest strata of the population. In a rare sight this week, a cruise ship pulled into the port at Acajutla. More than 300 European tourists disembarked and received an introduction to El Salvador and its culture. Meanwhile, in an oft-repeated sight in the old center of San Salvador, street vendors clashed violently today with police who were dislodging them from unauthorized locations. There was damage to property and at least 7 people arrested. See more in this photo gallery from El Faro. One positive story about youth in El Salvador are the thousands of young people in Scouts in El Salvador. The Scouting movement in El Salvador has programs which offer a positive alternative to gang activities. You can read about the Scouting movement in El Salvador in this Wikipedia article. This week LaPrensa has a photo gallery of the Scouts participating in activities commemorating the February 22 birthday of Robert Baden Powell, founder of Scouting. More than 20,000 Salvadoran were deported from the US back to El Salvador during 2007. That means one out of every 300 persons in El Salvador right now arrived courtesy of US immigration authorities in the past 12 months. Looking north from El Salvador, one quickly realizes that there is no stopping this tide. The latest United Nations figures indicate that 1,070 people every day are leaving El Salvador for the trip north. This human flow is not a flow that will be stopped; it has been institutionalized and constructed into the societies of El Salvador, and of the United States. The latest public opinion poll results show improvements for Salvadoran president Tony Saca and his ARENA party. In a poll by Mitofsky Consultants and published in La Prensa Grafica, the percentage of Salvadoran's who approve of Saca's job performance grew from 51.3% in November 2007 to 58.6% now. It's not clear to me what caused this increase since Saca's popularity had been declining steadily over the past few years. When asked which party they would vote for if the 2009 elections were conducted today, 29.8% opted for ARENA, 24.3% chose the FMLN, and the big winner was undecided/no response at 40.6%. Note that the poll did not associate a candidate name with either political party since ARENA has not yet chosen a presidential candidate. These numbers largely reflect the numbers of the party faithful of the two major parties. The 2009 elections will be decided by who can move that large block of persons who don't want to declare a party loyalty. The results of the Third Height Census, carried out in 5,361 public and private schools on April 25, 2007, showed a national chronic malnutrition rate of 15.5% in students age 6-9 years, an improvement of four percentage points compared to the 2000 Height Census. An article in the Salvadoran newspaper El Mundo reports statements by a US official that the US will stay neutral in El Salvador's 2009 presidential elections. The United States will not intervene in El Salvador's political process nor will it take a stance for or against any of the participating political parties, according to remarks attributed to Director of Central American Affairs in the US State Department, John Feeley. [C]omments by US officials may be bolstering ARENA's message. Last Sunday, White House Special Assistant Otto Reich gave a phone-in press conference at ARENA headquarters. According to local newspapers, he said he was worried about the impact an FMLN win could have on the country's "economic, commercial, and migratory relations with the United States." Eleven days after charges against the Suchitoto 13 were reduced from terrorism to public disorder, the charges were completely dismissed today by a judge in Suchitoto. It was a somewhat curious end to this case where demonstrators were originally facing 60 years in prison -- the charges were dropped after nobody from the prosecutor's office showed up in court for the hearing. According to El Faro, the representative of the prosecutors' office arrived minutes after the judge dismissed the charges, blaming his late arrival on car problems along the highway. The prosecutor indicated his office would need to decide whether to appeal the dismissal. 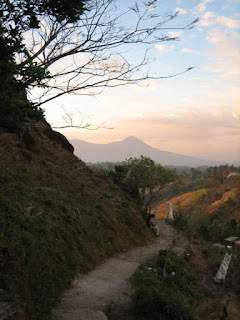 There are a lot of beautiful sights in El Salvador including some on the heights around San Salvador. I took the picture above from the high spot south of San Salvador called Puerto del Diablo looking towards the San Salvador volcano in the distance. It was a Saturday afternoon just before sunset and this popular location was busy with Salvadorans enjoying the view and the cooler temperatures at this high point. A few days later I was at the top of the San Salvador volcano at Parque Nacional El Boquerón where I took this picture looking down into the volcano's steep crater. The road to the summit on the west side of the volcano has spectacular views looking out over coffee bushes towards agricultural lands below. On Friday, February 8, the prosecutor in the case of the "Suchitoto 13" announced that the charges of terrorism were being reduced to charges of "public disorder." The case arises out of demonstrations against President Saca's water policy in the town of Suchitoto on July 2, 2007. Thirteen people, including leaders of CRIPDES, a Salvadoran NGO, were arrested and charged with committing acts prohibited by El Salvador's Anti-Terrorism law. We expect Chavez to provide generous campaign funding to the Farabundo Marti National Liberation Front (FMLN) in El Salvador in its bid to secure the presidency in the 2009 election. President Tony Saca, in Washington for meetings with President Bush, immediately asked for an investigation into the allegations and called for Venezuela to stay out of El Salvador's internal affairs. In interviews, Mauricio Funes denied that Venezuela would be providing any funds for the FMLN's election campaigns, stating that financing would be done from the party's own funds. The FMLN issued similar statements. In the night's one true hiding, former CONCACAF giants El Salvador took a step toward renewing their past glories with a 12-0 whipping of outgunned Anguilla. Rudi Coralles scored five goals to move to the top of the region's scoring charts while aging ace Ronald Cerritos grabbed a hat-trick in what should effectively put an end to Anguilla's dream of reaching the next stage. The next match between the two teams is in Washington D.C. in March and the winner of the series advances to face Panama in June. All of this leads towards the World Cup in 2010 in South Africa. SAN SALVADOR, Feb 5 (Reuters) - El Salvador, the only Latin American country which still has troops in Iraq, is prepared topull out most of its 280 soldiers there amid growing opposition at home to the U.S.-led war. "I believe the time is coming to pull out almost all of our troops," President Tony Saca said on Tuesday. Saca was seeing off the 10th contingent of Salvadoran soldiers to serve in Iraq, but said that the next batch of troops could be reduced to a handful. "I cannot talk of an 11th contingent," Saca said. In August, El Salvador cut the size of its six-month contingents to Iraq to 280 soldiers from a previous level of 380. Saca, who is one of U.S. President George W. Bush's closest allies in Latin America, flew to Washington later on Tuesday. He is scheduled to hold talks with Bush on Thursday. According to a report in La Prensa Grafica, 2007 was warmer than usual. The average temperature was 0.2 degrees Celsius warmer than average. This is the fourth year in a row in which temperatures have been higher than average in the country. The scientists note, however, there is not enough data to establish a trend or whether this is part of patterns of global climate change. The highest temperature in 2007 was 43°C on March 21 and the coldest was 4°C on January 17. LPG also quotes scientists at the environment ministry who worry that increasing temperatures can adversely affect food production with the possibility of increased droughts and unstable weather. Hoping to ride the Latin American wave of ''21st century socialism,'' El Salvador's former Marxist guerrillas appear to be in their best position ever to win power. Though the vote is more than a year away, the Farabundo Martí National Liberation Front (FMLN), now a political party, is considered the early favorite after nearly 20 years of right-wing rule by the ARENA party, one of Washington's closest allies in Central America. Polls suggest that a majority of Salvadorans are ready for change, and the FMLN claims it's ready to capitalize on that sentiment and piggyback on the recent electoral success of other left-wing parties in the hemisphere. Can we see benefits of DR-CAFTA? The Dominican Republic-Central America Free Trade Agreement (DR-CAFTA) with the United States was supposed to enable El Salvador to increase its exports to the U.S. market and attract foreign investment. However, economists consulted by IPS said that is "unrealistic" and that ordinary Salvadorans are still waiting for the promised benefits. René Salazar, head of the Administration of Trade Treaties, said DR-CAFTA was El Salvador’s "most important trade agreement" because it has promoted increased trade with the United States.